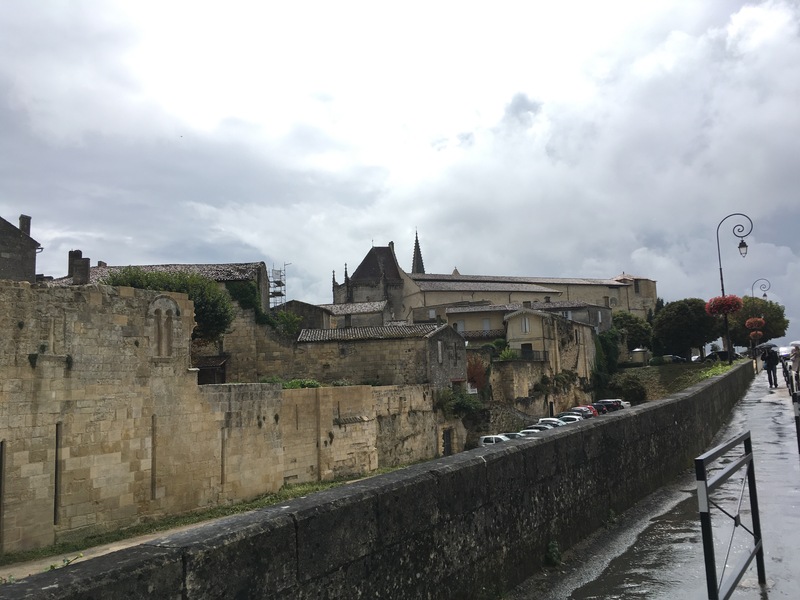 In amongst the vineyard covered hills of Bordeaux’s countryside, nestled in between chateaus and charming farmland, is the UNESCO world heritage site, the quiet town of Saint-Emilion. Made rich by the miles and miles of world-quality vineyards surrounding it, this hill-top town is extremely clean, well kept and beautiful, signaling it’s inhabitants wealth and prosperity from the copious amounts of wine it produces every year. We arrived in the afternoon, on an extremely rainy day, to go for a wander. We arrived on the hill top, just outside the Church and parked in the car park. From there, we went into the church – a lovely stone building, with bare, magnolia coloured stone walls and stain-glass window at the alter end. When you enter the church, there is a tree stump, glittering and covered in golden nails; a box of nails sits on top, with a hammer – you must take a nail, and hammer one into the wood. We did so, nodded in prayer, and then left. Then, we went in search of lunch; many of the building that look like restaurants, are, in fact, wine shops; the few restaurants we could find were extremely expensive, due to the affluent nature of the town’s inhabitants. We eventually found a medium priced restaurant, and sat down to have lunch. Most of the seating is outside, in a little square – despite the fact that it was raining, it did not matter so much as the whole area was covered with outdoors umbrellas; and despite the fact it was pouring with rain, we were, for the most part, dry. The drinks and kids meals came first, and then the adult’s food, half an hour later. By this time, the children had finished and were already getting restless – so it was unfortunate timing on behalf of the restaurant. Despite this, my Galettes, ‘Les Vegetariennes’ was delicious, as was the vegetable soup. 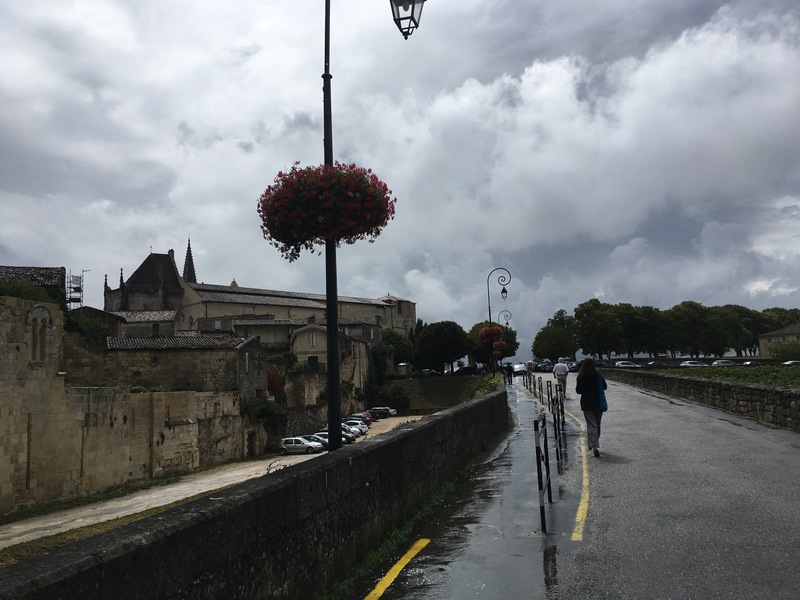 Overall, Saint Emilion is a lovely day-trip for wine lovers and foodies alike. Just try not to go when it’s raining!